100 Flower Spacer Beads. Lead and nickel safe. Silver plated. Keep your jewellery, findings and beads tarnish free by removing when washing your hands, showering, swimming, exercising and before going to bed. Keep your jewellery, findings and beads tarnish free by removing when washing your hands, showering, swimming, exercising and before going to bed. Use a soft cloth to clean once a week. Lead and nickel safe. 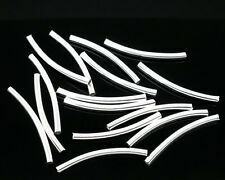 Bright silver plated curved tube spacer beads. Size: 30mm x 2.5 mm. Colour: Silver plated. Quantity: 25 pcs. - UK ONLY. Silver Plated Shiny Heart Spacer Beads. ● Spacer beads. ●Bead size approx 4mm. ● You will receive 100 beads. BUY ANY 6 ITEMS PAY FOR 5...TOP QUALITY ROUND SPACER BEADS 10mm SILVER PLATED... SILVER PLATED... TOP QUALITY ROUND SPACER BEADS ... 10mm 50 per bag.... HOLE 4mm.. CLICK HERE FOR MORE ITEM INFO AND A LINK TO OUR EBAY SHOP FOR THOUSANDS OF GREAT CRAFT ITEMS...PLUS BUY ANY 6 ITEMS PAY FOR 5. 1000 x 3mm Spacer Beads. ● Spacer beads. ●Bead size approx 3mm Dia. ● You will receive 1000 beads. 500 x 4mm Spacer Beads. ● Spacer beads. ●Bead size approx 4mm Dia. ● You will receive 500 beads. 50 x Antique Silver Plated Brass Alloy Round Beads. Bright silver plated oval spacer beads. Size: 6mm x 4mm. All our findings are nickel, lead and cadmium free. Quantity: 50 beads. - UK ONLY. Colour: Silver Plated. Quantity: 100. Hole Size: approx 1.2mm. Size : approx 3mm X 3mm. You will receive 500 x 4mm Silver Plated Daisy Spacer Beads. Silver Plated Daisy Spacer. Each Spacer bead is 4mm in size (approx). Gold Plated Spacer Beads Sizes 2mm, 3mm and 4mm. Silver Plated Spacer Beads Sizes 3mm and 4mm. Nickel free and lead free. Ideal as spacers between other beads, or as end beads for earrings e.t.c. 40 Silver Plate Smooth Heart Spacer beads. A popular spacer bead for all your jewellery making projects! LEAD & NICKEL FREE. ALL ORDERS ARE DISPATCHED WITHIN 24 HOURS. Hole Size 1.4mm. Gold Plated Spacer Beads Sizes 2mm, 3mm and 4mm. Silver Plated Spacer Beads Sizes 2mm and 3mm. Nickel free and lead free. Ideal as spacers between other beads, or as end beads for earrings e.t.c. Bright silver plated heart spacer beads. Size: 6mm x 4mm. All our findings are nickel, lead and cadmium free. Quantity: 30 beads. - UK ONLY. 2nd class - 85p for first item and then 5p for each extra item. You will receive 100 x 4mm Silver Plated Daisy Spacer Beads. Silver Plated Daisy Spacer. Each Spacer bead is 4mm in size (approx). 200 x Antique Silver Plated Brass Alloy Daisy Spacer Beads. Bright silver plated donut ring spacer beads. Size: 8mm x 2mm. 30 Lantern Spring Wire Bead Cages. Lead and nickel safe. Silver plated. Keep your jewellery, findings and beads tarnish free by removing when washing your hands, showering, swimming, exercising and before going to bed. 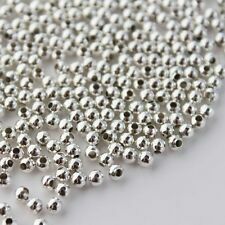 You will receive 30 x Silver Plated 6mm Stardust Spacer Beads. Silver Plated Stardust Spacer Beads. A must for all jewellery / craft makers. (except weekends). Material Type: Iron, Silver Plated, not 925 sterling silver. Quantity: 100 beads per bag. Gold Plated Spacer Beads Sizes 2mm, 3mm and 4mm. Silver Plated Spacer Beads Sizes 2mm and 4mm. Nickel free and lead free. Ideal as spacers between other beads, or as end beads for earrings e.t.c. Stardust Beads, Brass, Silver Plated. Make Supersized Seem Small. Hole approx 1.8 mm. Tray size will fit 12mm cabochon/flatback. Silver plated adjustable adult round tray setting ring. - UK ONLY. 2nd class - 85p for first item and then 5p for each extra item. SILVER PLATED RHINESTONE 5 HOLE SPACER BAR - 10 NO.